It may be that time of year where the year end procedure is approaching. To some Sage 200c users this can be a daunting task. It can be a stressful and challenging time of year for many employees (please see our office stress blog for some hints and tips on keeping cool). With the need to ensure all transactions have been entered and accounts balance, these deadlines can be mentally exhausting. We are here to help run the process of year end smoothly. 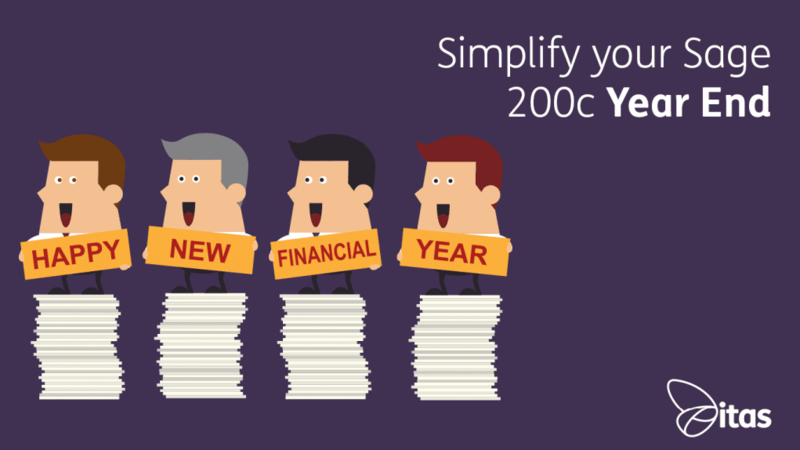 At the end of each financial year you need to ensure your accounts are up to date and prepare for the next financial year. A year end procedure is the method by which you close off the previous accounting year and open a new one. An accounting year does not have to be the same as the calendar year and in many cases it is not. It is also the case that many companies do not use the expected 12 month period. Please follow the checklist below. Input all transaction relevant to the current financial year. Clear down disconnected logins. Accounting System Manager>System Utilities>User Login Status. Update waiting postings and check deferred postings. Reconcile sales and purchase. Ensure that the aged debtors and creditors reports reconcile up to the end of the financial year for sales and purchase ledgers. Print all required reports. For example; Profit and Loss, Balance Sheet, Trial Balance, Stock Valuation, Aged Debtors and Creditors Reports. Check all periods are closed. Close all accounting periods for the year in Accounting System Manager>Accounting Periods>Maintain Accounting Periods. Take a SQL backup of the company data. (You may need to get your Sage 200c support team to do this for you). It’s always important to back up your data in case of a computer malfunction when running your year end. Completing a backup before running year end reduces the chance of important data being lost. Check report type. Ensure all Balance Sheets and P & L reports are correctly assigned. Make any changes before running yearend. This is important. Archive tick box. Make sure the option to archive transactions after this period is ticked or transactions will not be stored in Historical. Nominal Ledger>Utilities>Ledger Setup>Ledger Settings. The year end process can only be run once in a financial year, care is needed to ensure all steps are completed correctly before running this process. When running the year end procedure, the box above will appear. Ensure all reports have been run and tick the boxes to say the required reports have been printed. These reports cannot be reprinted once year end has been completed. 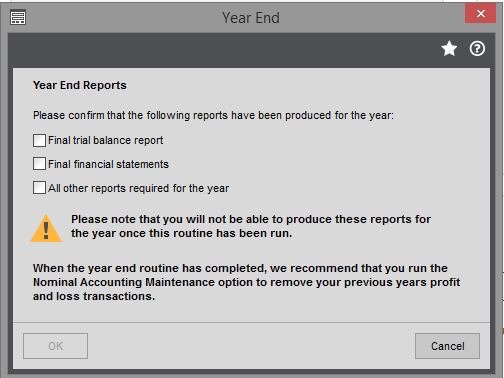 You will notice the text on the bottom of that window ‘When the year-end routine has completed, we recommend that you run the Nominal Accounting Maintenance option to remove your previous year’s profit and loss transactions’.To run the nominal accounting maintenance go to Nominal Ledger>Period End Routines>Account Maintenance. Tick the remove profit and loss transactions tick box as shown above. 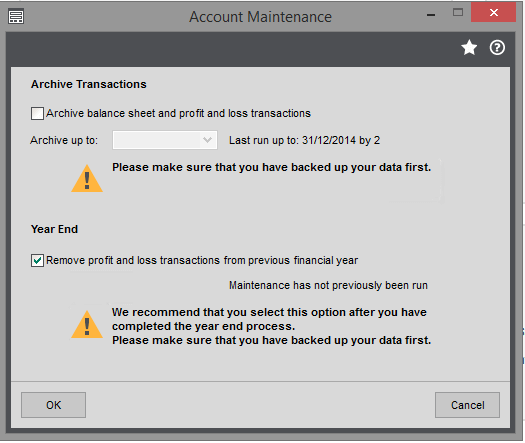 Please note: If you are using Sage 200c version 2011 or below, account maintenance is not on this version. There is a tick box to remove all nominal transactions associated with profit and loss accounts on this version. Please ensure you tick this box. Print a Trial Balance. Check that only Balance Sheets items are showing. Store and save the report as this cannot be reproduced later once postings are made to the nominal. Print and Save it. Before entering any transactions open the required periods. Accounting System Manager>Accounting Periods>Maintain Accounting Periods and open the required periods by clicking on the period and click change period status. When the change period status box is greyed out, this usually means the user does not have the relevant permissions. User permissions can be amended within Maintain Accounting Periods User Permissions. The Year End procedure is now complete. Go grab yourself a nice coffee and pat yourself on the back, you made it! Now to the next financial year. If you still need help, check out our guides. If you have any ideas for any future blogs you would like to read, we would love to hear from you! Contact us here!